When veteran book publicist Kathryn Hall becomes an empty nester, she happily moves to a small village along the California coastline, gets a dog and starts a garden, realizing a longtime dream. Fashioning a lifestyle she had not anticipated, she has found herself beginning every morning out in the garden, in her PJs, ever since. Early on, she had an epiphany. "Everything I observed in the garden was also true in my life." She began taking notes. 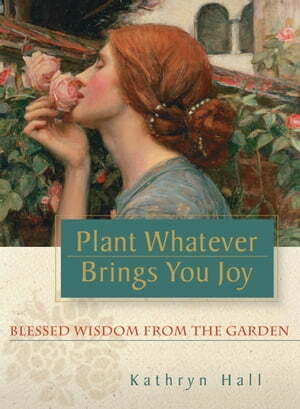 Over time and many gardens, and the creation of her award-winning gardening blog, she distilled her metaphorical observations into Plant Whatever Brings You Joy: Blessed Wisdom from the Garden. In it she lovingly offers readers 52 profound and memorable insights, sharing a lifetime of heartwarming and poignant stories, both in and out of the garden, designed to encourage and spark each reader's own inner journey to find his or her own unique truth, joy and purpose. "...as luscious as a peony in full bloom. Thank you for walking me in the garden of your heart." --Dawna Markova, Ph.D., author of I Will Not Die an Unlived Life and co-author of Random Acts of Kindness "Hall uses the enduring metaphor of the garden...illuminating the human adventure." --Spirituality and Practice "...Kathryn Hall shares her insights about the knowledge and inspiration found in gardens and the natural world..."
--Publishers Weekly "[Hall] creatively shares her observations with poignancy, humor and grace. Take it to the beach!" --Beverly Hills Times "Simple and profound, it will help awaken your own graceful flowering!" --Brooke Medicine Eagle, author of Buffalo Woman Comes Singing and The Last Ghost Dance "...a fascinating read. I highly recommend this book!" --Bob Tanem, "In the Garden with Bob Tanem", KSFO, San Francisco "Hall skillfully writes with the style of ladies who lunch. Her writing is a joy to read: elegant, fun, and definitely unique." --Dig It! Magazine "...this book is insightful, practical and entertaining." --New Spirit Journal " This is a spiritually uplifting and wise book!" --Angeles Arrien, Ph.D., Cultural Anthropologist, author of The Four Fold Way and The Second Half of Life "Miss Hall's book is truly fascinating. It keeps readers engaged, and leaves you with a string of deep thoughts to mull over late at night..." --Examiner.com "It's easy to get drawn in to reading the eloquent prose and seeing one's self in each of the pages turned." --Helen Yoest, author of Gardening with Confidence "A lifetime's worth of heartwarming and poignant stories" --GreenPrints magazine "The garden as a metaphor is by no means a new literary concept but this is a fabulous packaging of that idea." --Telluride Watch "I wanted to enjoy every page, every story as long as possible... These stories teach and nourish the soul and spirit."